I like your turtle! and it just made me think of a dream I have of leaving in one of those 'tiny house' that people are using and can even pull behind their vehicle. Hey! maybe I can get this and someday hang it in my 'tiny house' if I end up getting one! Yes Marlene , I need to go into my shell once in a while to reflect about life. Beautiful picture with an brillant, meaningful. introspective description. I love all your work Marlene. TRUE SENTIMENT ABOUT ARTISTS AND I ALSO LOVE THE STYLE AND FEEL OF THIS ONE. I had to comment on your turtle painting and what you wrote about it. 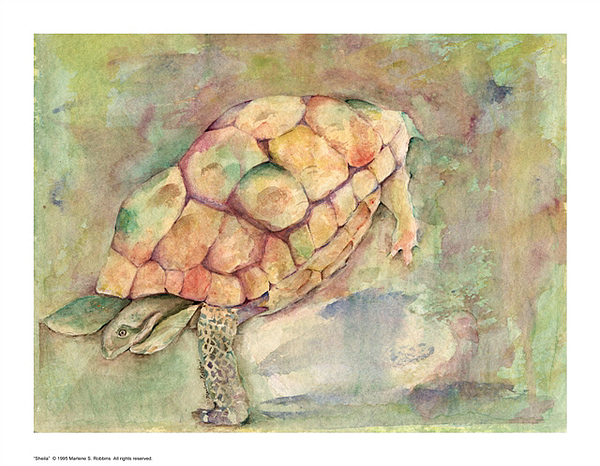 I love the painting and brings to mind the beautiful see turtles of Akumal which is the Mayan word for " place of the turtle" and is the home for a sea turtle preservation project. I totally agree with you about an artist's need to go into your "shell"! I went through a turtle phase. Turtles teach us to slow down. They carry their home with them wherever they go. Sometimes I am like the turtle. I go into my shell.I learn a lot while I am in there being introspective. Then, when i come out, after my resting time, I am ready to face the world. I think this is important for us artists.